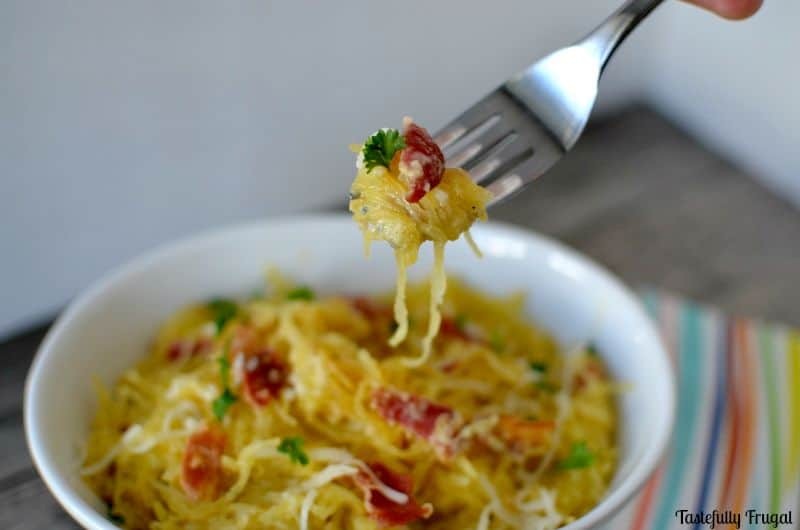 Put a spin on a favorite pasta dish by using spaghetti squash. Hey there and welcome to September’s Monthly Ingredient Challenge! 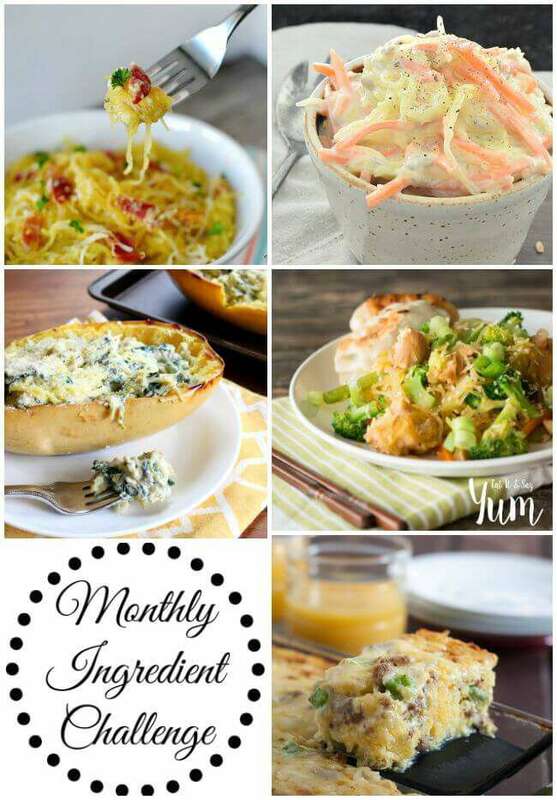 This month’s ingredient was spaghetti squash and I was a little unsure of not only what to make or how to make it. 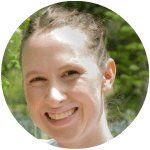 You see, this girl here is a carnivore; and it wasn’t until since I had kids that I started to open my eyes (and tastebuds) to the wide world of vegetables. I’ve found that my boys really do like vegetables, especially if I add cheese to them, like the Parmesan Zucchini we have with almost every meal. 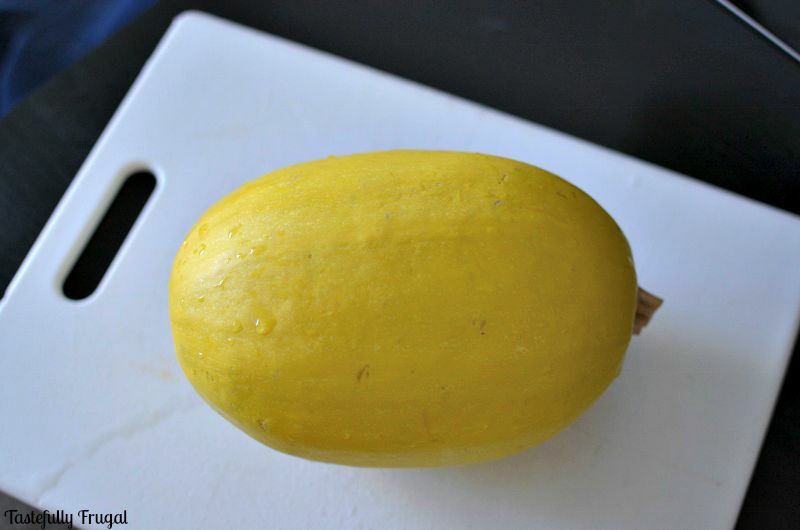 But spaghetti squash; what do I do with that? I did some research and found it got the name because when it was cooked it could be pulled apart and look like spaghetti. So I decided to try this spaghetti carbonara recipe, a favorite spaghetti dish of ours, and substitute the spaghetti squash. Bonus: my boys had no idea they were eating a vegetable they thought they were eating plain ‘ol spaghetti. Bonus number two; there is bacon in it and EVERYTHING is better with bacon. I have heard the spaghetti squash can be hard to cut. Luckily I have the best knife set ever, in my opinion, and cutting it open was a breeze. To prepare the spaghetti squash you’ll want to preheat your oven to 400F. 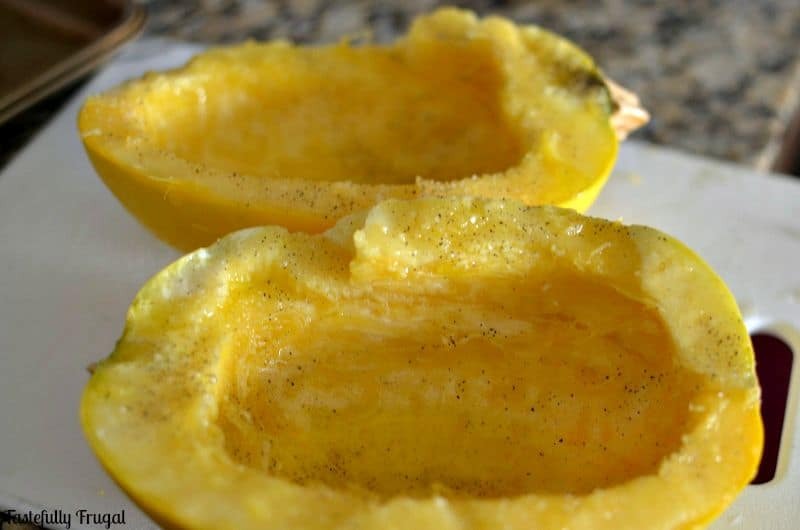 Cut the spaghetti squash in half vertically and remove the seeds and insides. They are much like a punpkin on the inside and I want to try cooking the seeds like pumpkin seeds next time; I’ll let you know how it goes! Place, cut open side down, on a greased cookie sheet and bake for 50-55 minutes. Remove from oven and using the Ov Glove flip over and place on a plate. Using a fork start at one end and pull towards the center. The squash will easily come apart and look like spaghetti. Now that you have your spaghetti squash made it’s time to add in the tasty parts. If you’ve never had Spaghetti Carbonara before, it’s a lighter pasta brought to life with the flavor of bacon, garlic and parsley. 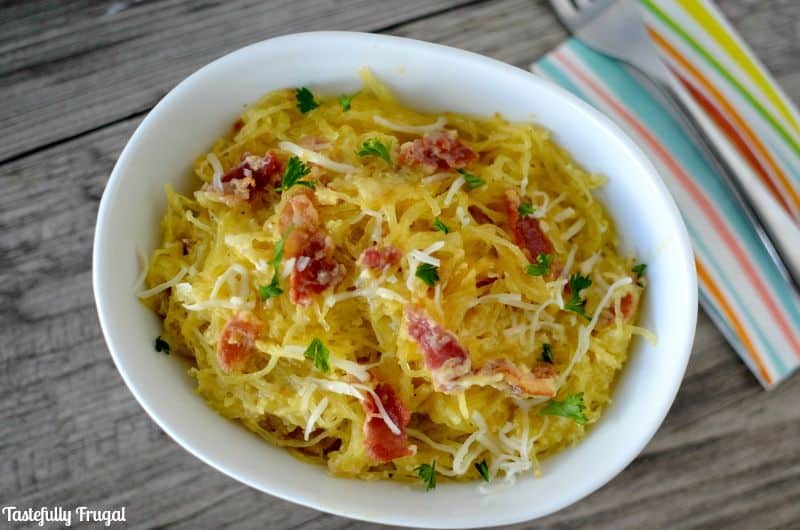 It’s one the most cooked pasta dishes in our house and after it was gobbled down by the boys when I used spaghetti squash; I think it will quickly become one of our favorite vegetable meals too. In a large skillet cook bacon until crispy. While bacon is cooking whisk eggs together in a bowl and add cheese. Stir to combine. Remove bacon from skillet and shred. Keep about 1 Tbsp of bacon grease in skillet and saute garlic over medium heat for 1-2 minutes until fragrant. Add 1/2 of the spaghetti squash to the skillet and stir to combine. Add 1/2 of the egg/cheese mix and stir to combine. Add bacon and butter and stir to combine. Remove from heat and top with parsley and more shredded cheese. 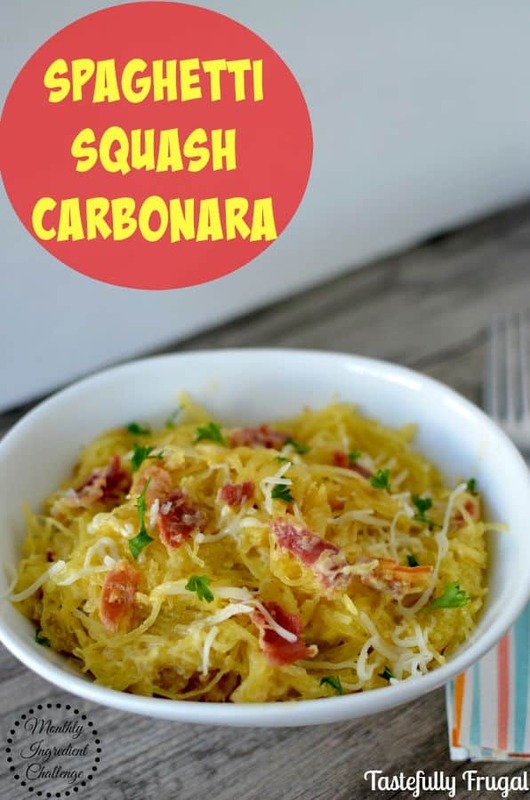 Now that you’ve seen how I cooked spaghetti squash check out these other tasty recipes using my new favorite vegetable! Click each picture to be taken to the recipe. Yum! Everything is better with bacon. 🙂 Pinned. I totally agree Leia! Heading over to check out your chow mein now! This looks fantastic! I discovered spaghetti squash a few years ago and I rarely make regular spaghetti anymore. My kids absolutely love it. My boys love it too! I think we will be substituting spaghetti squash for spaghetti from now on.